2012 was our tenth anniversary year, and we felt it would be good to choose a new logo. 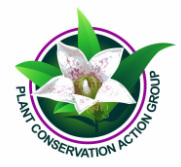 The name of our organisation already gives the focus of our activities - plant conservation. The flower is that of 'Bwa Sitron' or Wright's Gardenia, Rothmannia annae, which is a critically endangered endemic plant, found naturally only on one small island in the Seychelles archipelago. So it represents our main focus - conservation of rare species. The newly opened blossom represents our desire to freshen our resolve to mobilise action for plant conservation in Seychelles. The 3-dimensional effect reflects the dynamism of our organisation. And the circular design represents our ability to work as a cohesive and inclusive group to achieve our goals.